This is a road sign I saw in the southern island of Tasmania. Since I had heard that penguins come back after sunset, I waited for them. Sure enough, I was rewarded by the return of many penguins as the sun sank below the horizon. To go another small island from there, I needed to wade through the sea and climb over rocks. 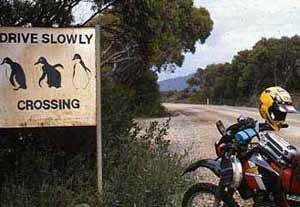 I found quite a few penguin lairs there. That small island was the most southerly part of Australia for me. I stood alone there and shouted toward the South Pole. It was an unforgettable feeling of exhiliration. Tasmanian nature is amazingly beautiful. As I was riding my motorcycle,I saw forests, rivers, mountains and lakes. When I went to a beach with a harpoon and torch by night, I was able to catch several flatfish and crabs. In my travels I met many kind people in Tasmania as well. For example, when I was with four Aussie riders and we could not find any hostel and stood in freezing cold rain, an elderly lady provided us beds for the night. People naturally start talking after making eye contact. In Tasmania, as in other places, many a good conversation or lasting friendship began with a smile. I realized many times how wonderful a smile can be. Copyright © Since 24 May, 1997 HIROSHI TAKADA, All Rights Reserved.